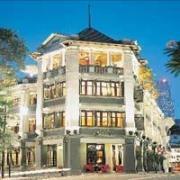 The Scarlet, Singapore’s first luxury boutique hotel, made her debut in December 2004 after a S$45 million acquisition and refurbishment. Vivacious and uninhibited, the interiors of this 80-room hotel pulsate with an eclectic tension, offering all who enter an adventure for the senses. Location: The Scarlet Hotel in Singapore is less than one mile from the Siang Cho Krong Taoist Temple, Capital Tower and Maxwell Food Centre. One mile from the hotel sits Chinatown Heritage Centre and Far East Square. Located in the city center on Ann Siang Hill, the hotel is 20 kilometers from Singapore Changi International Airport.